Langtang Ganjala Pass Trek starts from Sybru Bensi, ends at Melamchi Pul Bazar. From Sybru Bensi, you will follow the Langtang river to the east until you get to Kyanching Gompa (3,049.). Some 5 km to the south of Kyanching Gompa are the peaks of Naya Kanga (5,846m) and , to the south east, Ponggen Dopku (5,930m). Kyanching Gompa is surrounded by Mt Langtang Lirung (7245m ) on the west, Yala peak on the north , Dorje Lakpa(6966m), Urkeinmang(6387m), Loenpo Gang (6979) and Kangchenpo on the north-east. In Kyanjing Gompa there are a small Buddhist monastary and a cheese factory started in 1955 by the Swiss Association for Technical Assistance. When you are crossing the pass there are spectacular views of Langtang Lirung and the Tibetan peaks beyond. Much of this route is spent above 3,000m (10,000ft) .The highest point of this trek is Ganjala Pass (5,122m ). On the very pass of Ganjala , the last few 100m trail is precarious so we use a rope there for safety, though the utmost care is enough. The descent from the pass is on a steep slope for over 1 km which requires good care again. But the rest of the trail is easy and comfortable. As there are no lodges and no settlements for three days along the way, the group should be well equipped with enough food. Only organised camping treks are possible for this region. The use of firewood is also prohibited within the park, so all supplies should be taken with us. The trek requires 13 days .The people living in Langtang are of Tibetan origin, though they introduce themselves as Tamang or Gurung. After passing the Ganjala Pass, the trail takes you to Malemchigaon and Tarke Ghyang .People here call themselves Sherpas but their relationship with the Sherpa of Solu Khumbu is distant. The dialects spoken are also different. People here follow the Buddhist religion so you will find many old Buddhist monasteries in the villages. Tarke Ghyang is another Sherpa town along the way, which bears its own story. The town name means temple of “100 horses” and was taken from the name of a temple established in 1727 by a Lama ( Buddhist monk ) who was called on by the king of Kathmandu ( Kantipur) to stop an epidemic. As his reward the Lama asked for 100 horses, which he brought here. The local temple, rebuilt in 1969, follows the Bhutanese style. Spectacular views of the Ice fluted peak Gyanghempo. Drive from Kathmandu to Syabrubesi(1610m) by Bus. 7 hours driving. O/N at guest house. [B L D Plan]. Trek from Syabrubesi to Lama hotel (2480 m.) Walking 5:30 hours, O/N at guest house. [B L D Plan]. Trek from Lama Hotel to Langtang village (3541 m.) Walking 5 hours, O/N at guest house. [B L D Plan]. Trek from Langtang village to Chorkariri(5050m) and back to KyangjnGompa. Walking 7:30 hours, O/N at guest house. [B L D Plan]. Trek to Ngegang( 4520m). Walking 7:30 hours, O/N at Tent. [B L D Plan]. Ganja La pass( 5130m) and trek to Keldang( 4420m). Walking 7:30 hours, O/N at Tent. [B L D Plan]. Trek down to Dukpa( 4040m). Walking 6:30 hours, O/N at Tent. [B L D Plan]. Trek to TarkeGyang( 2600m). Walking 6 hours, O/N at guest house. [B L D Plan]. Trek to Sermathang( 2590m) Walking 6 hours, O/N at guest house. [B L D Plan]. Trek to Malemchi Bazar and drive to Kathmandu by Jeep and transfer to the hotel at 3 stars level. Walking 3 hours and driving 3 hours. O/N at hotel. [B L Plan]. Kathmandu to SyabruBensi (1462m/4795ft) (6:30 hours). Drive from Kathmandu to SyabruBensi by bus via Trisuli Bazar and Dhunche( popular town). You will witness nice scenery of White Mountains of Mt. Annapurna II, Manasalu, Ganesh Himal and other minor peaks are visible from Kakani (along the route) and as well as green scenery of hillock, rivers, village, while driving to Syaprubensi. Syabrubensi is an attractive village with large stone houses. SyabruBensi to Lama Hotel (2510m/8232ft). 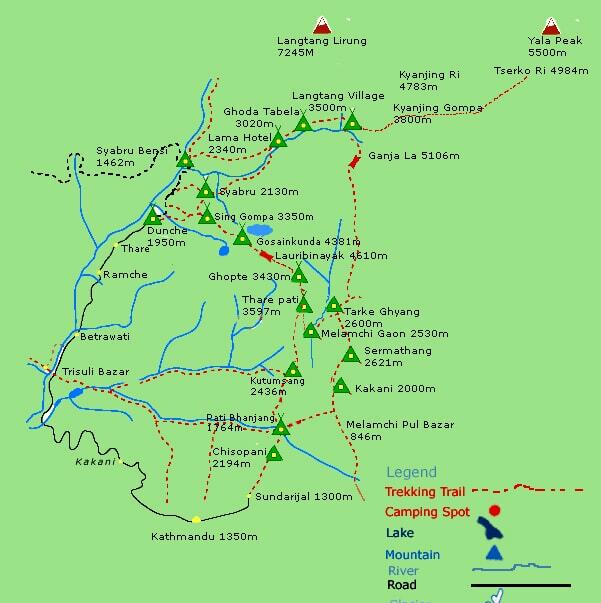 From Syabrubensi we begin our trek by following the Langtang River, a river we will be following over the next few days, all the way to the head of the valley. After crossing the suspension bridge, the trails ascent ridge to Paira Lodge and after Paira Lodge, the trails, gradually ascent until to New Bridge and the trail climbs up to Rimche and after 40 minutes, we get then to Lama Hotel. This day, you might be feel wilderness and might get opportunity to see wild animals like monkeys, red Pandas, Himalayan Black Bears etc. Lama Hotel to Langtang village (3307m10846f). From Lama Hotel the trail gradually climbs up to GhoraTabela through a forest of hemlock, oaks, maples and rhododendron with spectacular, fleeting glimpses of Mt. LangtangLirung (7,244m). Leaving GhoraTabela, the path follows the delightful LangtangKhola, climbing steadily up to the spread-out Langtang village (3,500m). At the afternoon, we hiking up to KyanjinRi and back to KyanjinGompa. Langtang village to ChorkariRi (5050m/ 16564ft) and back to KyanjinGompa. Get up an early morning at 5:30 am. The trail climbs gradually to Sindum and to Yamphu (3640m). Crossing the LajaKhola then climbs a moraine to a viewpoint where you can see KyanjinGompa and the dramatic icefall flowing from LangtangLirung. After KyanjinGompa, climb to the top of Chorkariri (5050m). Enjoying spectacular panoramic mountain views of the whole Langtang Himalayas, including LangtangLirung (7,244m), LangshisaRi (6,810 m.), Gyanghempo (6,888 m.) Ganjala peak, Nayakang more…. Besides, incredible mountain views, Langtang valley views with dramatic icefall flowing from LangtangLirung and Gyanghempo peak can be seen. KyanjinGompa to ChorkariRi (5050m/ 16564ft) and back to KyanjinGompa. Trek to Ngegang( 4520m). Ganja La pass( 5130m) and trek to Keldang( 4420m). Walking 7:30 hours, O/N at Tent, FB plan. Trek down to Dukpa( 4040m). Walking 6:30 hours, O/N at Tent, FB plan. Trek to TarkeGyang( 2600m). Walking 6 hours, O/N at guest house, FB plan. Trek to Sermathang( 2590m) Walking 6 hours, O/N at guest house, FB plan. Trek to MalemchePul Bazar and drive to Kathmandu by Jeep. . Walking 4:30 hours walking and driving 3 hours. O/N at guest house, FB plan. We’ve just been back from a fantastic trip of the Annapurna Sanctuary( Annapurna base camp). 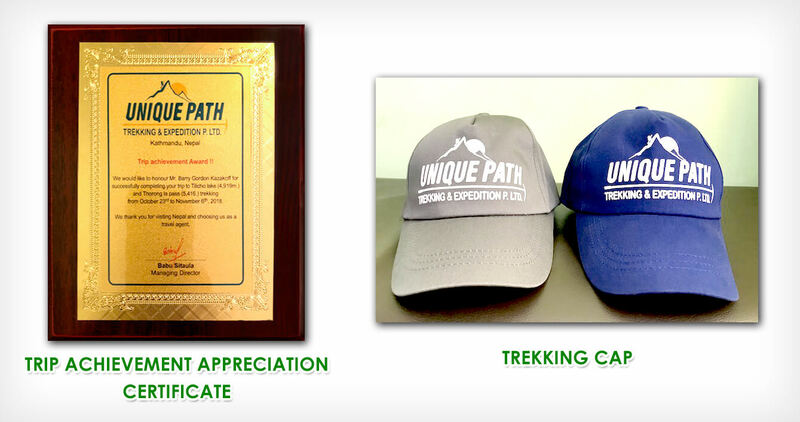 This is our first time in Nepal and Unique Path Trekking Agency did provide us an extraordinary trekking experience. They did provide us excellent mountain Guides with professional attitudes and strong mountain porters. We are very much impressed by the scenic mountains as well as the enthusiasm of the guide. The cook can do almost every style and it’s really tasty. We’re sure that we’ll come back to Nepal again to trek in the marvelous wild nature with them. All accommodations during the treks. Food, drinks, accommodation, insurance, salary, equipment’s, transportation, local tax for Guide and porters. Equipment like ice axe, Ice crew, snow bar, climbing rope while crossing Ganjala pass.